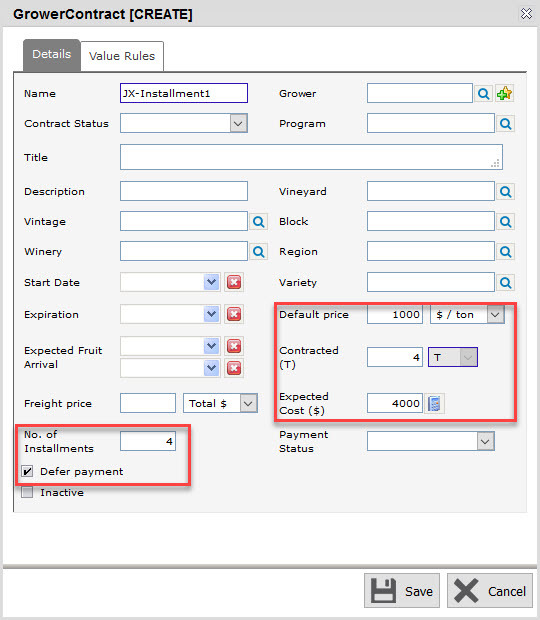 The cost of fruit coming into the winery can be tracked with or without grower contracts. This article assumes you already have the basic knowledge about Grower Contracts. 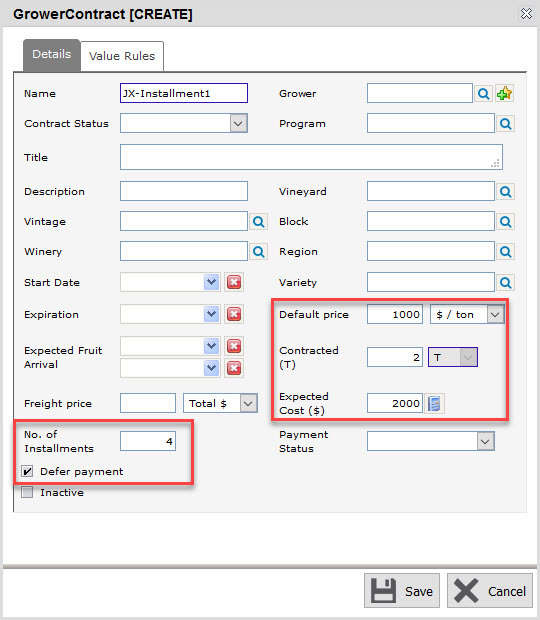 By default, grower contracts will assign costs to fruit that at the time of receival as long as that contract is selected on booking or delivery. This method simply looks at the Price per ton (tonne) configured and multiplies that by the fruit received. 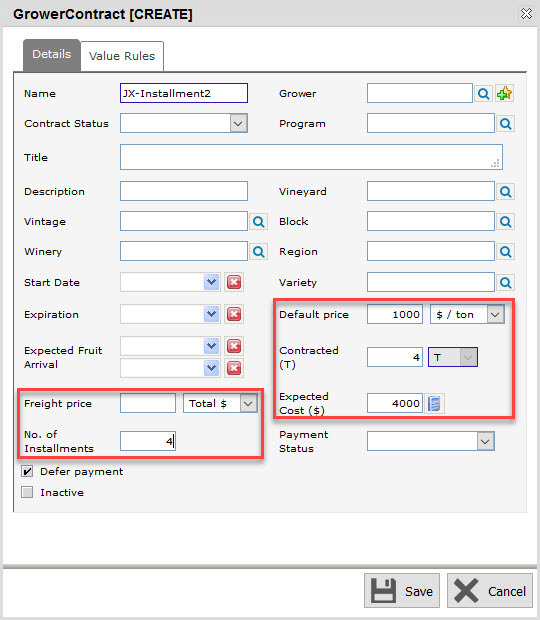 If Value ranges have been configured (brix ranges, for example) that may increase or decrease the default price per ton (tonne). However, if the contract is set for Deferred payments no costs are added to the fruit until an installment payment is made for the contract. 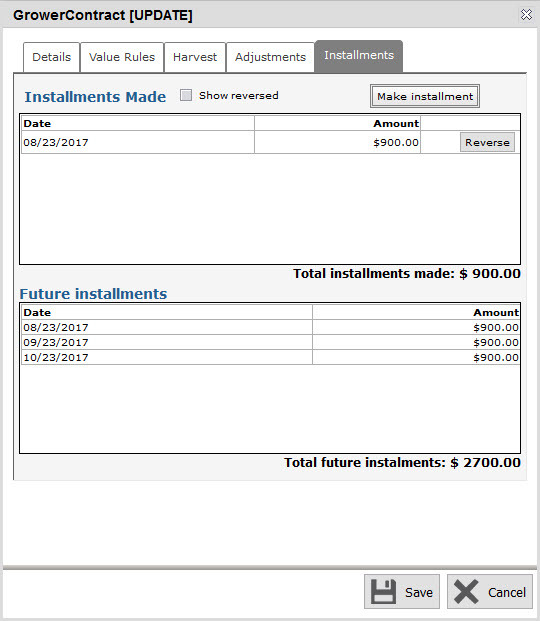 This allows you to manage flexible payment terms to your growers and have the cost set following harvest when the full amount received is known. Creating a new Grower Contract will show two tabs. 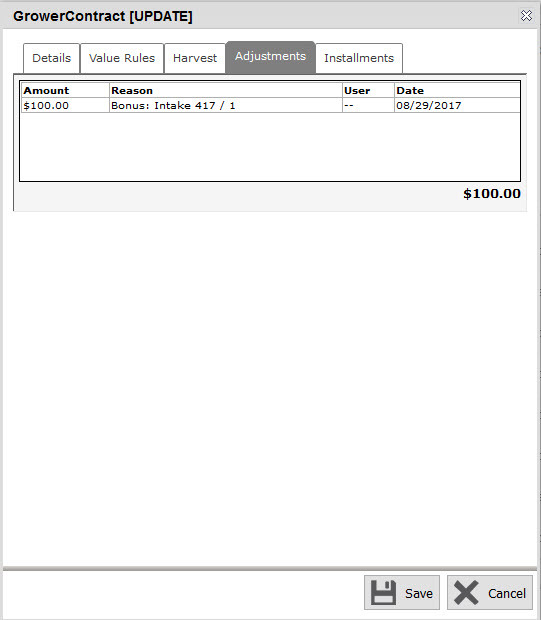 One for the Grower contract fields Details and the other for setting up adjusted costs with Value Rules. Default price: The price of the contract. Contracted(T): The expected tonnage of fruit, for the contract. Expected Cost: An expected cost based of the default price and the contract amount. You can use this value to compare to the actual cost of the contract at the end of harvest. Defer payment: This is the option that determines whether or not to have the costs tracked by payments against the Grower contract. If accounting integration is enabled, any new contract created will have deferred payments turned on. No. of installments: The number of payment installments to split the contract into. Payment Status: A payment status of either completed or in progress. Once the last payment is made this status will change to completed. 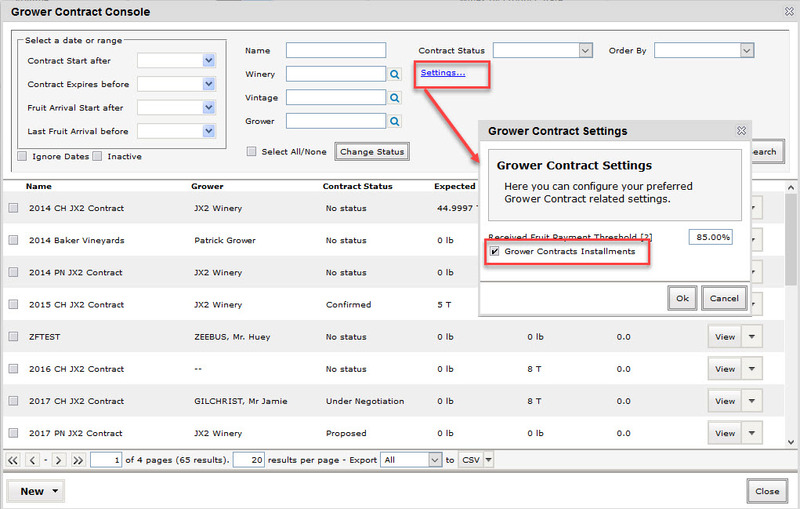 This field can be use to help track contracts that aren’t complete in the Grower Contract Console. 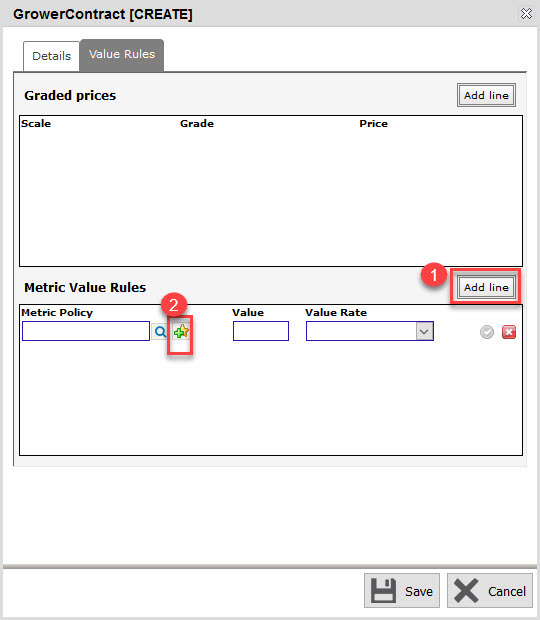 The tab contains the Metric Value Rules. 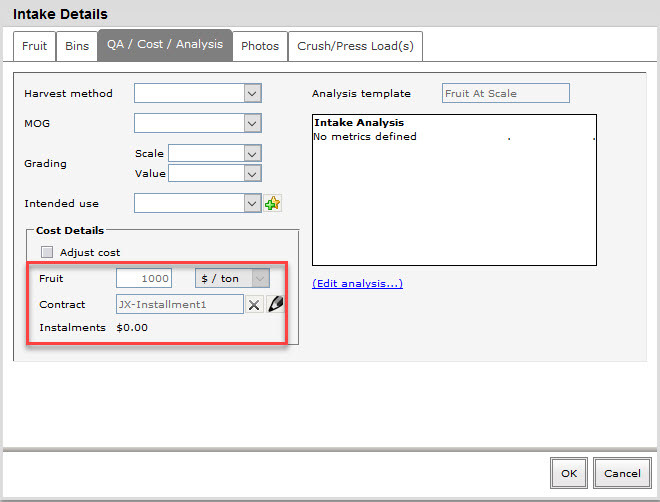 Metric Value Rules: Adds a bonus cost to the fruit intake, based of an analysis reading using Metric Policies. For example, you may pay bonuses for certain ranges of Brix recorded and so you can set your rules for this payment schedule using this feature. $/t: increases the cost by the Value per tonne/ton. 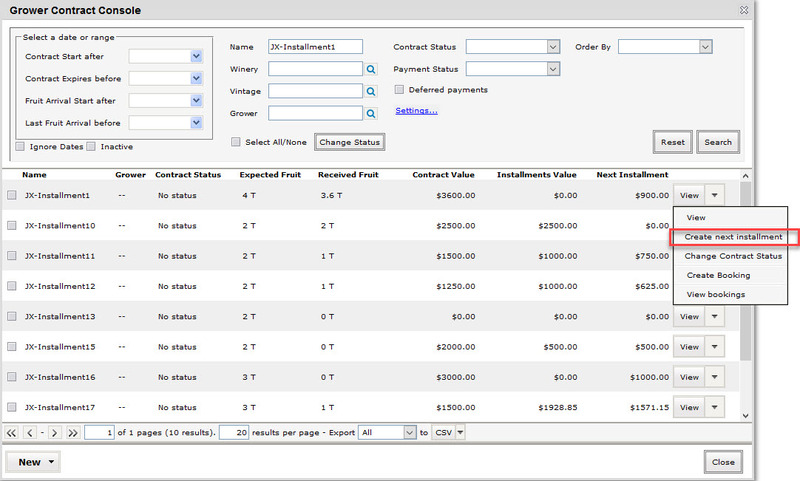 Once the Contract has been created and used, additional tabs are displayed on the Contract. These tabs help provide an overview of fruit coming in against the contract and the expected costs. 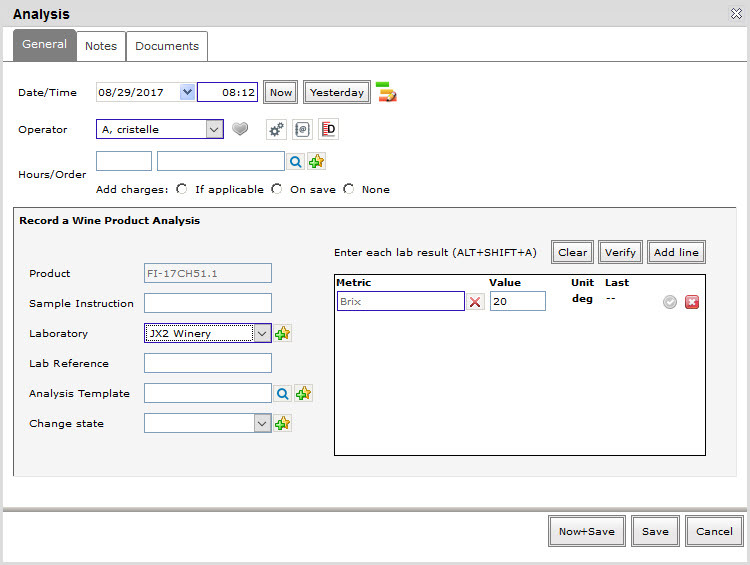 Adjustments: Shows a list of cost adjustments done to the contract, such as bonus payments from the Metric value rules. Installments: Shows a list of installment costs applied to the contract. This is useful for seeing the costs of the contract when making multiple installments. Using a Contract with Deferred Payments enabled will delay costs being added to the fruit, until a payment installment is made against the contract. To enable the Defer payment option if you don’t have accounting integration enabled, go to Grower Contract Console and click on Settings. 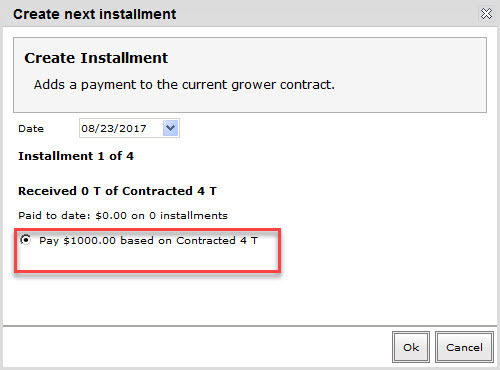 Tick on Grower Contracts Installments checkbox. If you have accounting integration enabled, the Defer payment option is on by default. This will enable the Defer payment option and allow you to enter the No. of Installments in the grower contract. The contract will appear on the intake under the Cost details. When the intake is saved, there won’t be any cost saved against the fruit at this time. The default Received Fruit Payment Threshold is 85%. This setting determines whether to base your installment payment on the Contracted tonnage or the Received tonnage. For example, if we’ve received less than 85% of the Contracted amount of fruit against a contract, and an installment is made, it will be calculated using the Contracted tonnage amount. If the received fruit exceeds this setting, i.e. more than 85% of the contracted amount has been received, then the installment calculation will use the actual Received tonnage amount in it’s calculation. 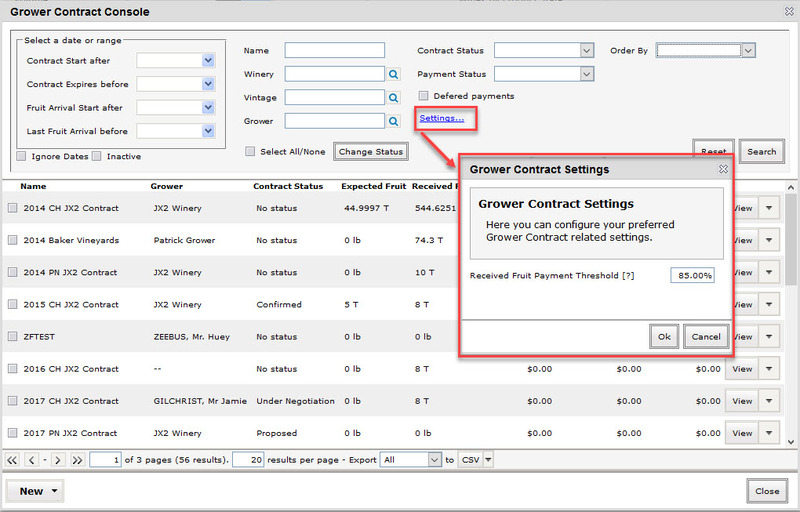 The Received Fruit Payment Threshold can be changed from Grower Contract Console – Settings. 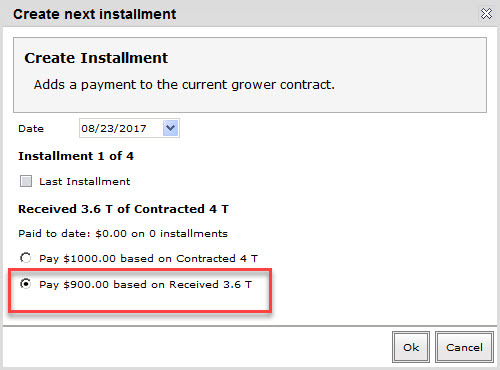 The costs for the contract can be split up into multiple installments by configuring the number of installments on the Grower Contract. For this example, let’s create a contract that will have 4 installments. Receive fruit for the contract. 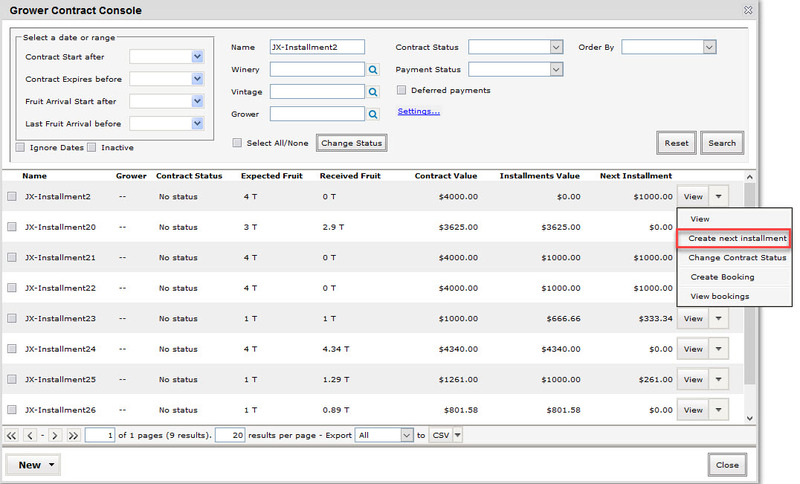 In the QA/Cost/Analysis tab of the fruit receival, you can view the cost of the fruit based on the selected contract. 3.6T of fruit has been received for the contract which is 90% of the Contracted (T). 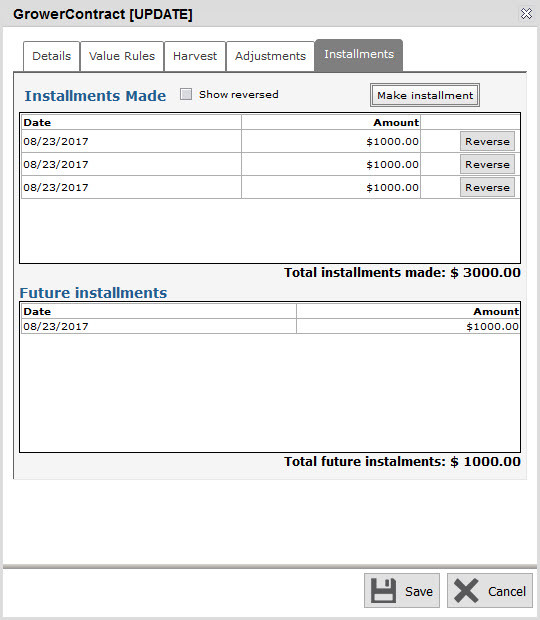 Create an installment for the contract by clicking on Create next installment in the dropdown menu. In this case since our contract is 4 installments, the first installment is 25% of the total payment value. As we have also exceeded the Received Fruit Payment Threshold (3.6T of 4T is 90% and the setting is 85%) then we get the option to pay based on Received tonnage instead of the Contracted amount. See the image bellow. You have the option to select making the payment based on the Contracted amount instead at the time of making the installment. Click on Ok to complete the first installment. In the Installments tab, you can view the installments made and any future installments. You can also make new installments from this tab by clicking on Make installment button. Let’s take for example that you already have made 2 installments against the contract and you decided that the third installment will be the last one. Select the Last Installment checkbox. When checked, all the remaining contract’s cost will be applied to the fruit in one final installment. 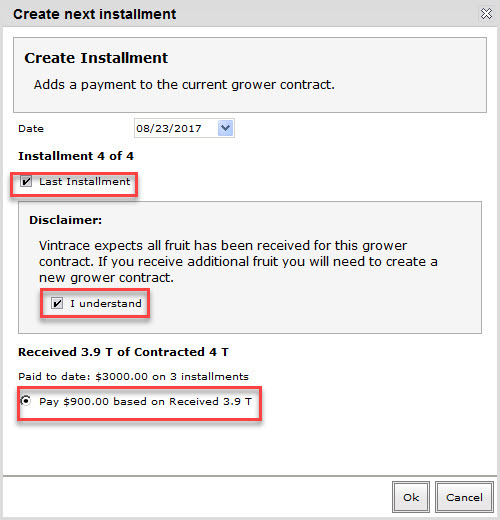 This option requires all fruit to have been received for the contract, otherwise, you have to create a new grower contract if you have more fruit coming in. The full amount was applied to the fruit intake and there are no more payments expected. 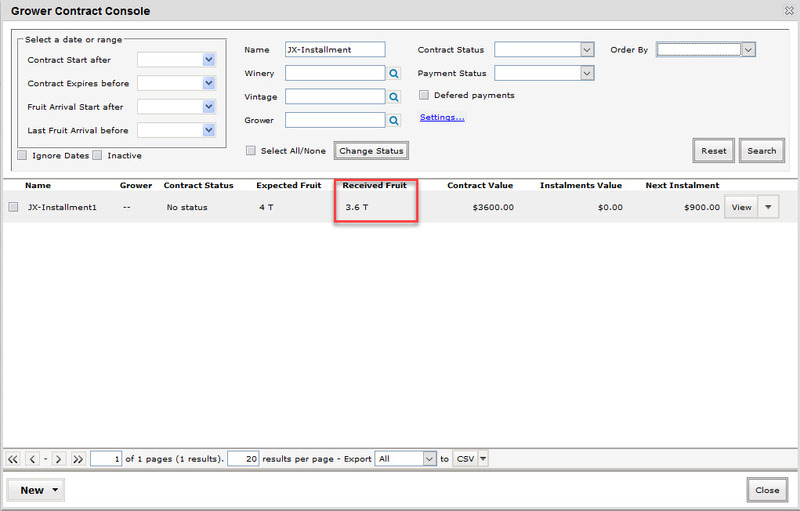 Create an installment for the contract by clicking on Create next installment in the drop-down menu. The first installment is automatically calculated for you based on your number of installments. In this case since our contract is 4 installments, the first installment is 25%. 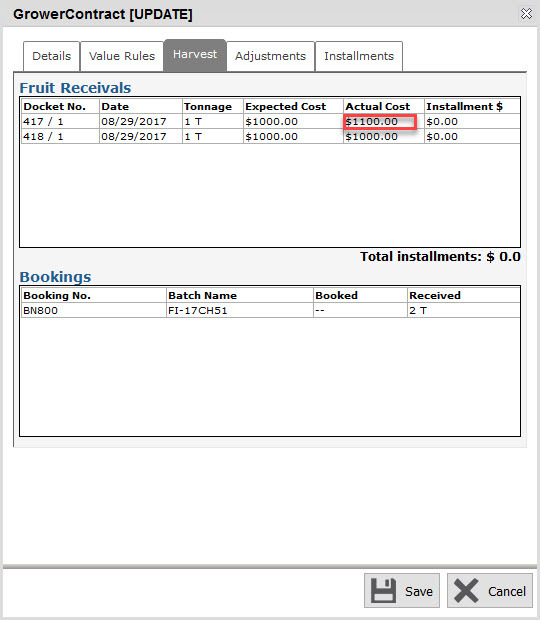 By default the percentage calculation selected is based on the Contracted tonnage because you have not received any fruit. Let’s take for example that you already have made 3 installments based on the contracted 4T and you’ve now received a total of 3.9T. When you make the last installment, the cost will be adjusted based on the cost of the total fruit received. 2. Performing an analysis operation after the fruit intake. For this example we will show performing the analysis after the fruit intake has been recorded. 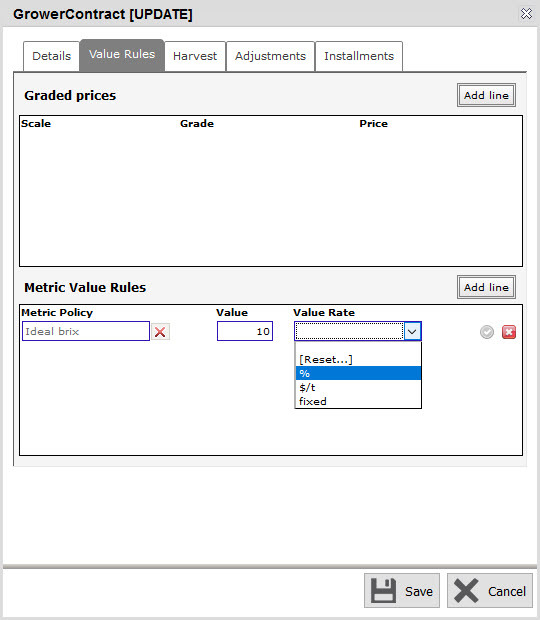 Create a metric value rule for your grower contract. In the example below, any fruit intake with an analysis reading that satisfies the metric policy “Ideal brix” will add a bonus cost of 10%. 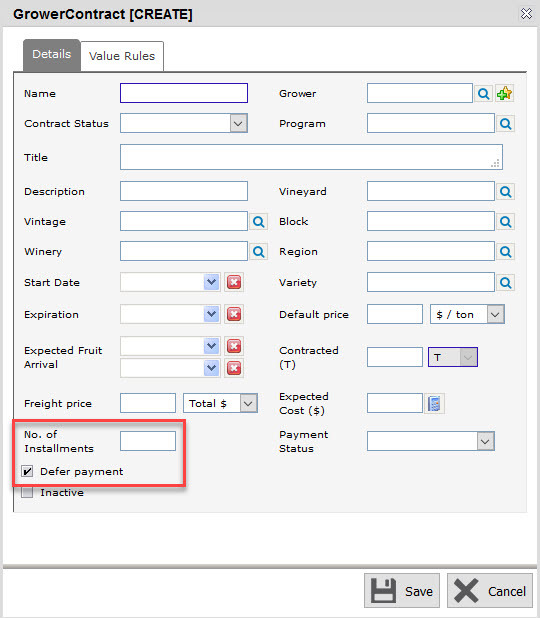 In the Value Rules tab of your grower contract, click on Add line button then click on create icon beside the Metric policy field. Then create the Metric Threshold Policy. 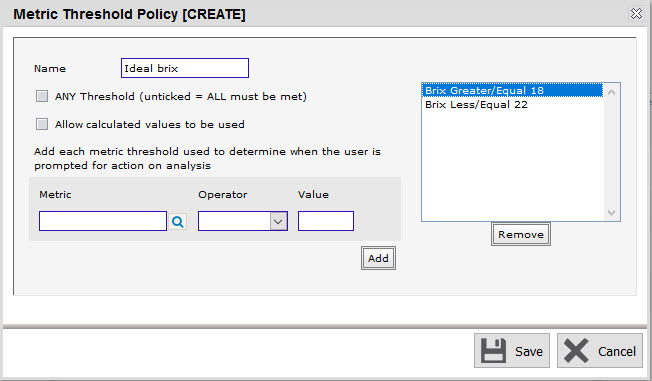 In the example below, we created a policy where brix reading is between 18-22. Click on Save. Add the Value and Value Rate for the metric policy. In this case, a bonus cost of 10% is added if the Metric Threshold Policy is met. 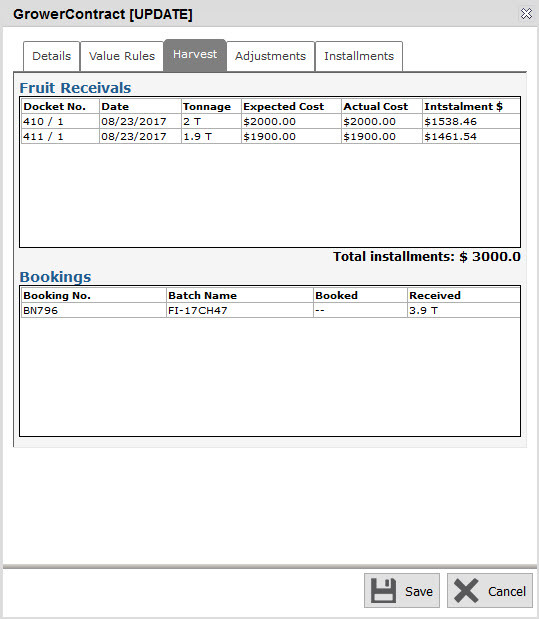 Create a booking and fruit intake for the grower contract. 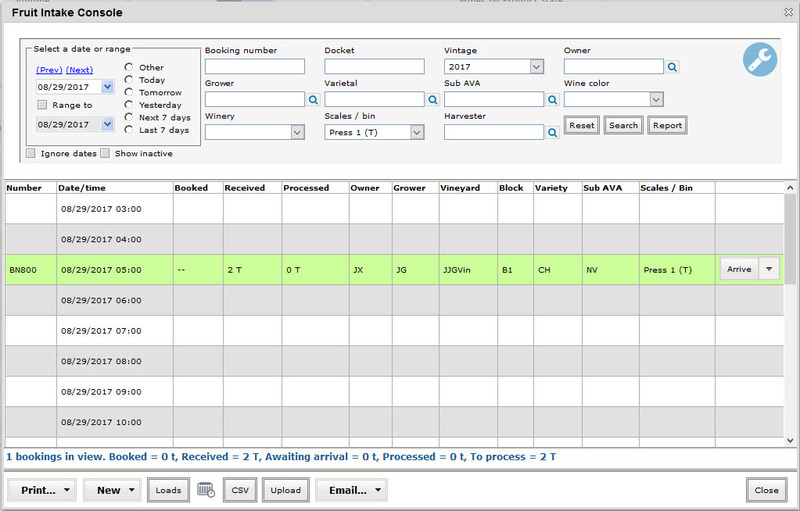 Locate the booking in the Fruit Intake Console and select the Analysis option. 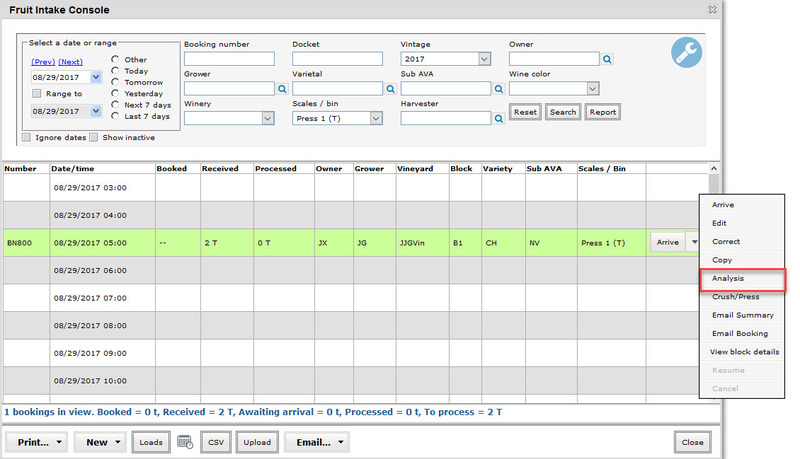 Select which intake to apply the analysis to. Record the analysis. Our metric policy required the Brix to be greater than or equal to 18 and less than or equal to 22 in order to trigger the bonus. The bonus applied to a fruit intake it will show up under the Adjustments tab as a bonus in the grower contract. 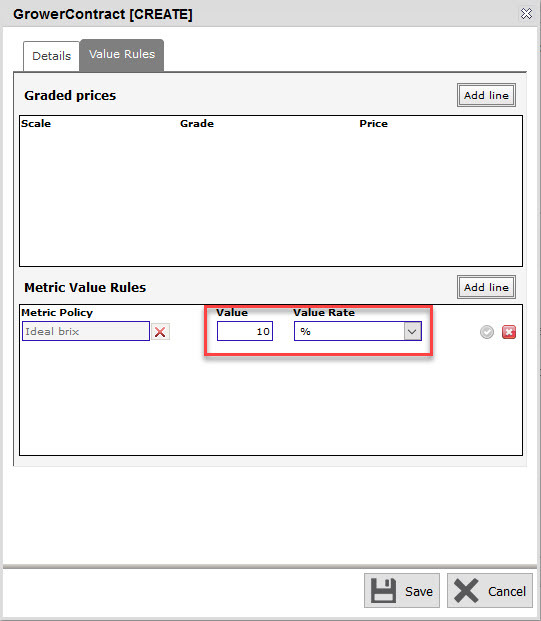 The metric rule policy we used in our example provided a 10% bonus.